“Adele is BRILLIANT. I try to avoid the cliche of saying something was life-changing but it honestly has been. My daughter had not slept longer than a 3.5 hour stretch since she was born and it had gotten progressively worse, to the point that she was waking up 5-6 times a night and fighting almost every nap, to the point where I felt I spent all day trying to get her to sleep. I was exhausted. Just before my daughter’s first birthday, I called Adele as she came recommended. During the free initial assessment call, Adele asked me what my dream situation was. I said “For her to wake up only once or twice a night.” Adele said, “let’s aim for no night wakings”. I thought it was impossible. But at the end of the 3 week period, my daughter was sleeping 12 HOURS STRAIGHT with no night wakings. She fought her afternoon nap pretty consistently and Adele recommended moving her to one nap a day, and she’s been napping much better since. The approach was so comprehensive and taught me SO much about sleep, circadian rhythms, baby’s sleep needs and development, and all the factors that impact the body’s ability to wind down. Soon after completing the 3 weeks, I travelled internationally for a month and although my baby struggled with time differences and sleeping in a new place every week, we regressed a bit, but Adele’s plan saved me from going all the way backwards to old habits. I was able to apply what I learned even in new places and new time zones. “I got help from Adele because I was having troubles with my 3 & 5 year old girls (who share a room). As a single mom of three, my youngest was 1.5 at the time by the end of the day I was exhausted. After getting my youngest to bed between 6:30/7 I would start bedtime with my oldest two, we had a decent routine going but it was taking me upwards of two hours to get them into bed and asleep. I couldn’t do it anymore. After talking to Adele on the phone she was able to come up with a plan to get us back on track. Within a couple week my girls were getting onto more of a schedule and going to bed easier and most nights were in bed and asleep between 7:30/8! Having my nights back to myself to tidy up and relax has been amazing! Now if only I could train myself to go to bed earlier. “Adele helped us transition our 2-year old from our bed to a separate bed in her own room. We had gotten lax and had absorbed a lot of bad habits that needed to go. A giant milk bottle before bedtime, rocking and holding her until she fell asleep, bringing her to our bed every night when she woke up, giving in at almost every turn because it was easier in the short term… But in the long term, we weren’t sleeping well and our evenings were limited to our super-long and chaotic bedtime prep. Things had to change! Adele supported and directed us in a way that worked well for our needs. She listened to our concerns, counseled us without guilt or negative feelings, quickly understood who our child was, and was easily available. I felt like I was learning best-parenting practices from a pro! “When we began the sleep training process, it definitely highlighted how much we–as parents–needed to work on communication and agreement on norms. But now I am beyond amazed at how we communicate better AND that we’ve been able to create a safe, consistent, and peaceful sleep environment for our LO. She’s gained an incredibly amount of confidence and seems so much happier, both during the day and when it’s time for bed. No more pacifier, she sleeps in her own bed throughout the night, and there’s no anxiety about bedtime. As a baby sleep consultant in the Bay Area, I consider it an honor to help so many tired families get the rest they need. 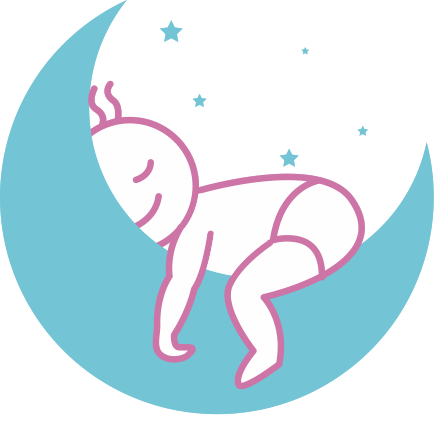 Reach out to me through my contact page or the Get Started page to make an appointment to talk about how I can help you and your little one get sleeping better. I serve in San Francisco, the entire Bay Area, all of California, and throughout the world. I look forward to helping you!